Tapcon - I believe these are the easiest to use for installation into brick or concrete!!!! Use 1 1/2 or 2" Tapcon screws available from any hardware store. You must use the drill bit provided. Click here for Tapcon product information Procedure for Window box installation: 1. Center window box in center of window. 2. Make sure the box is level (the longer the level you have the better) 3. With the window box where you want it use a Sharpie to mark the holes in the predrilled mounting bar. 4. Remove the box from the wall and use a 1/4" diameter drill bit to drill a hole in the concrete, wood or siding in the center of the mark you made in step 3. 5. Use 1/4" diameter screws or a little smaller. 6. I always recommend using a 12" extension on your drill to screw in the screws. It is a lot faster to run the extension through open design areas of the box instead of trying to get your drill or electric screw driver inside the window box. 7. Tighten screws, step back and enjoy the moment! Plastic Wall Plug - for use in masonry, plaster and drywall, with No. 6 or No. 8 screws. Will support load of 40 lb. for each screw according to manufacturer. - for use in masonry, plaster and drywall, with No. 6 or No. 8 screws. Installation Tip: Use small washer and nut on a longer screw to allow extra length to hang our wall plant holders directly on screw. Slotted Hex Head Toggle Bolt - Arms fold for insertion and open inside wall. For use in plaster and drywall use with No. 8 screws size. Will support load of 40 lb. on each screw with standard bracket. Slotted Hex Head Wall Anchor - with washer head - for hollow wall installation. Arms fold for insertion and spread open inside wall. Use screwdriver or hex socket. anchor - with washer head - for hollow wall installation. Arms fold for insertion and spread open inside wall. Use screwdriver or hex socket. 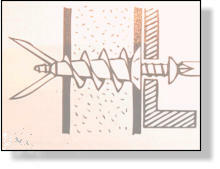 Heavy Duty Drywall Anchors - provides a solid secure installation. No pilot holes required for the self drilling anchors. Each holds up to 60 lb. according to the manufacturer. • Can be backed out of drywall. - provides a solid secure installation. No pilot holes required for the self drilling anchors. Each holds up to 60 lb. according to the manufacturer. • Can be backed out of drywall. - provides a solid secure installation. No pilot holes required for the self drilling anchors. Each holds up to 60 lb. according to the manufacturer. • Can be backed out of drywall. We hope these tips help make your installation go faster!